DoubleTree by Hilton Newcastle International Airport today held its official grand opening ceremony with the Rt Hon. David Miliband MP in attendance, along with prominent business leaders from across the region. 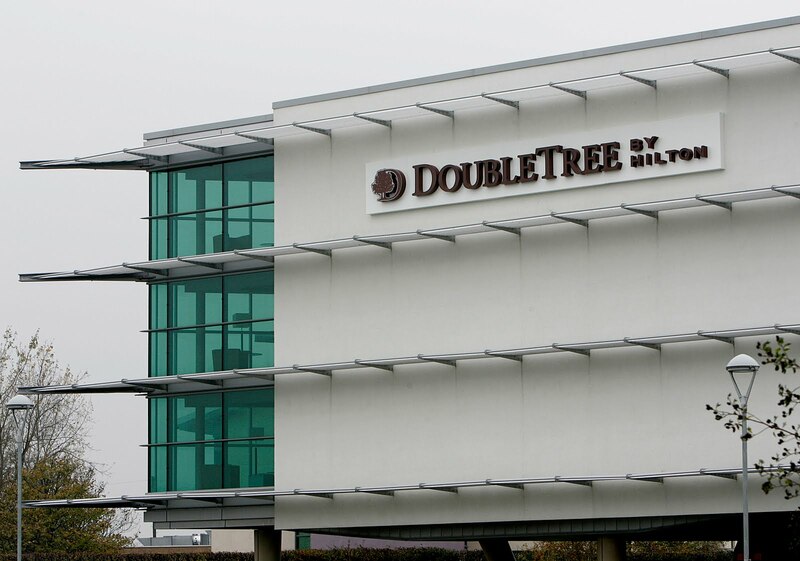 This tenth DoubleTree by Hilton UK location at the North East's largest airport, providing luxurious accommodations and outstanding meeting and event facilities, complements the airport's continued growth strategy which includes a terminal expansion and a focus on attracting the business community to the region with its connectivity and world class facilities. 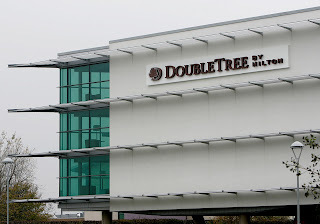 Dave Laws, chief executive of Newcastle International, said: "As the first internationally branded hotel at the airport, the DoubleTree by Hilton Newcastle International Airport is very much a sign of confidence in both the North East and in the airport. This iconic building is a gateway to our region delivering access to a global business network." "The airport currently employs approximately 3,000 people from across the North East. With 4.5 million people expected to travel through Newcastle International in 2012, we see further potential for increased visitor numbers in 2013 which will bring economic benefit, investment and employment to the region." David Miliband MP said: "The continued expansion of Newcastle Airport is great news not just for Newcastle but for our whole region. The North East has a lot to offer, whether it be our first class dedicated workforce, those coming to the region for weekend breaks or holidays or for those who choose one of the regions Universities to study at. The expansion programme at the airport will allow more people to come in and out of the region more quickly and efficiently, and to have a good quality hotel on site will add to the airports commitment of providing an excellent customer service". The DoubleTree by Hilton Newcastle International Airport is operated by Cairn Hotel Group under a franchise license agreement with a subsidiary of Hilton Worldwide. The Cairn Hotel Group, one of the leading private hotel owners in the UK, has invested over £30m in the hotel. It boasts 179 rooms, more than 2,200 square feet of flexible meeting space and conference facilities, a restaurant and bar, and is located less than a minute's walk from the airport's terminal. Aran Handa, director of Cairn Hotel Group, said: "As a family business based in Newcastle, we were delighted to take over this very well-located hotel development and make the DoubleTree by Hilton Newcastle International Airport a reality to welcome the world's travellers to the North East. More than 125 new jobs opportunities have been created across every department of the hotel – from senior management to entry-level roles that have the potential to lead to outstanding long-term careers in hospitality. Our team is excited to open this hotel under the DoubleTree by Hilton brand as part of the Hilton Worldwide portfolio of hotels, and we look forward to greeting guests as well as local residents to our outstanding hotel and conference venue." DoubleTree by Hilton Newcastle International Airport guests will benefit from the characteristic qualities found at more than 270 DoubleTree by Hilton hotels and resorts in 22 countries around the world, including the warm welcome of the brand's legendary chocolate chip cookie presented to every guest upon check-in; an array of upscale amenities and guest services; the rewards of the Hilton HHonors guest loyalty programme; and a unique and caring team member commitment to the local community. Gary Steffen, vice president – global brand performance, DoubleTree by Hilton, said: "DoubleTree by Hilton is delighted to continue expansion of our UK and European presence into the North East of England by introducing another outstanding hotel with the DoubleTree by Hilton Newcastle International Airport. The opening of our tenth location in the UK and the 25th hotel in Europe since 2008 is an extraordinary milestone. We hope that business- and leisure-oriented guests alike will enjoy our rewarding level of service, style and hospitality here in Newcastle with easy access to the North East's business and tourism interests from this great gateway location." Customers wishing to stay at the Doubletree by Hilton Newcastle International Airport can book on the website: www.newcastleinternationalairport.doubletreebyhilton.com, or by calling the hotel direct on 01661 824266.